← Just How Fresh is that FARM FRESH Salmon? GIANTS but I have always found their fans to be a rather humourous and presumptive bunch. They are very much like YANKEE fans. They expect to win the Super Bowl every year. It’s sort of laughable to me. I lived through a time when the NY GIANTS were a joke, with one losing season after another. It was only after the arrival of Bill Parcells in the 80’s that the GIANTS managed to kick that losers image. They have appeared in and won several championship games since then. The JETS during this time have done nothing but compile disappointment after disappointment…but that’s a story for another day. Today this JET fan will break down the 2013 NY GIANTS. Let’s take a closer look at why the team is such a shambles, shall we? 1-What running game? Since the departures of Brandon Jacobs and Ahmad Bradshaw, the GIANT running game has been basically non-existent. Though both of them suffered through numerous injuries during their Giant tenures, Bradshaw in particular had some of his finest moments while hurt. David Wilson, described as the next”running sensation” hasn’t made anyone forget Barry Sanders and his fumbling problems remind us of the early career of Tiki Barber. Jacobs returned to the GIANTS a couple of weeks ago and had a huge day in a loss. Can’t expect him to be what he was years ago. 2-The Offensive Line used to be one of the best in the league. The operative words being “used to”. These guys don’t run block and their pass blocking has turned Eli Manning into a running quarterback. The problems here are injuries and age. Snee out for the season. Diehl old and ineffective. Will Beatty signed a fat contract in the off season and has done little to show he deserves it. Rookie Pugh looks like a rookie and Center David Baas has been a huge disappointment. What a mess. 3-The quarterback is one of the top 5 or 6 in the league but has been under constant duress the entire year. Yes he’s thrown a bunch of interceptions but only because he is shouldering the pressure of trying to make something positive happen. he probably is doing way to much to try and gut out a win, You can’t blame him for trying. 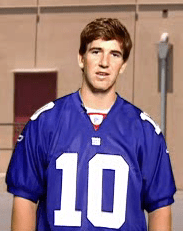 I shake my head when I hear GIANT fans trashing Eli Manning. I mean are you guys kidding? He’s won 2 Super Bowls against the vaunted New England Patriots (including the team that was going for a perfect season) and he was selected as the MVP both times. Without Manning the GIANT offense would be completely inept. 4-Are there any linebackers on this team? 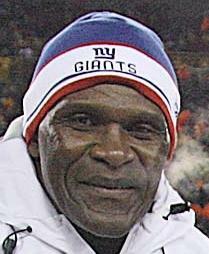 The GIANTS were famous for the likes of Lawrence Taylor, Carl Banks, Harry Carson and Pepper Burress. Now they start Herzlich, Paysinger and Rivers. Who dat? 5-My nephew Matt is a huge GIANT fan. Last week we were at the JET game versus the Patriots together and he says to me, “Id get rid of the entire defense except for JPP.” He’s got a point. 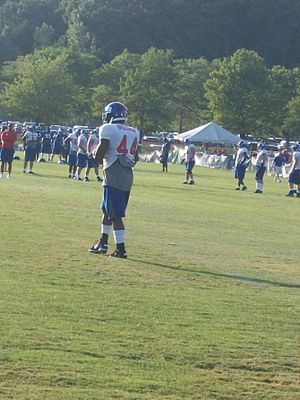 Osi left and the rest of the fearsome front four have also gone …even though they are all still wearing the GIANT uniforms. Where is Tuck? Kiwanuka? Joseph? This group has underachieved the whole season. 6-Will the real Hakeem Nix please stand up? This guy has done nothing to help Eli or the team. Trade rumours flying all over the place. I’d take a 2nd or 3rd rounder for this guy in a heartbeat. And so these are the reasons that this team is 1 and 6. At the beginning of the season I thought they would be 8 and 8… at best maybe 9-7 in a lousy division. GIANTS fans have been howling in disbelief at the play of their team. Did I expect 1 and 6 at this point in the season? No I did not but then I couldn’t anticipate the dissolution of both the offensive and defensive lines…which really is at the heart of the collapse. The GIANTS could win 4 or 5 more games this year if Eli plays great and the defense wakes up…otherwise Tom Coughlin may be looking at retirement and Jerry Reese will be doing extra careful study of college players. He needs a great draft and some key free agent pickups to turn this mess around. This entry was posted in NFL Football, Sports and tagged Ahmad Bradshaw, Eli Manning, New England Patriots, New York Giants, NFL, Super Bowl, Tiki Barber, Will Beatty. Bookmark the permalink.